Okay, that headline is a bit misleading. It makes it almost sound like the shawl is complete, which it is not. I have, however, reached a critical milestone! I have five more rows and then bind-off. That’s right, five more rows, over 500 stitches per row, and I’m done knitting this bad boy. I’m so thrilled! It took everything not to start knitting instead of getting ready for work this morning. 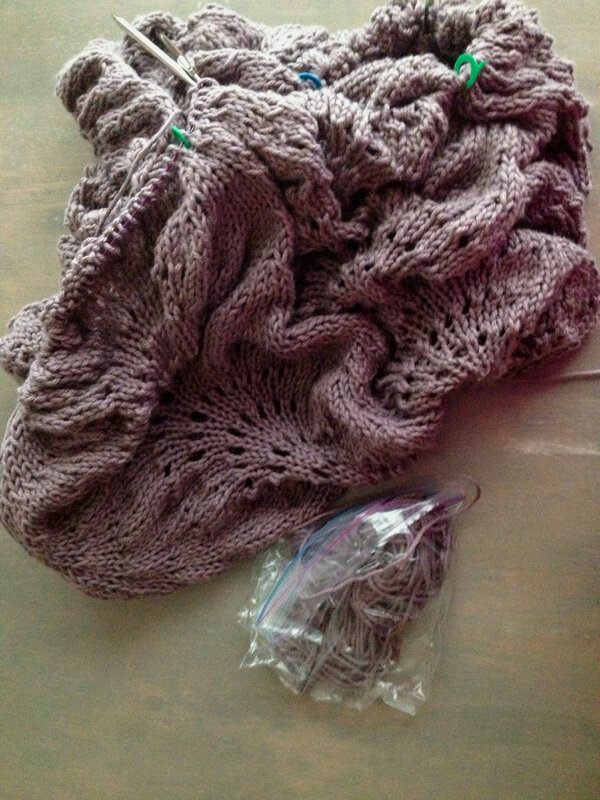 I have been steadily working on the shawl since Wednesday/Thursday of last week, really buckling down to the work. Some time on Saturday or Sunday, my hands became machines and I started to crank out row after row. Now, I’m so close to done, I can taste it! Better yet? The shawl will definitely be ready for Mother’s Day this Sunday. I’ve started daring to dream about new projects to work on. A coworker (and friend) of mine has this adorable grand-baby who fell in love with Chadwick from first sight. I’ve been wondering about making one for her. She’s just too cute. You know that if she came in and asked me, I would’ve written down all her favourite colours and started planning that very instant. There’s also the cowl I want to make with the neon green and grey Madeline Tosh yarn I got at the DFW Fiber Fest. I still haven’t decided which cowl I prefer, but I’m starting to lean more towards the Sonoran Cowl. We’ll see. What WIPs do I still have lying around? I have lace socks. I’m about halfway through the first sock, so one more to go. I have my yellow shawl, which is the same pattern as the one I’m making for mom. I have plenty of spinning to do. To start or to continue? That is the question.